Spices can appeal to the eye as much as the taste. 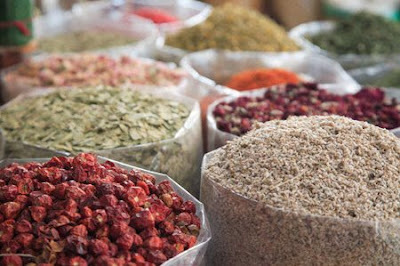 Dubai has a market dedicated to spices. Located in Deira by the creek large sacks overflow with many varieties. 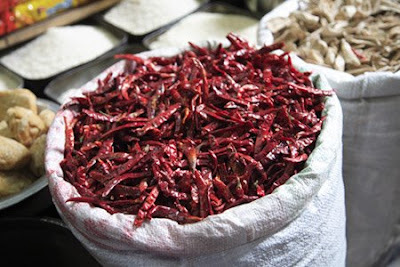 These deep red chiles in India were found in the narrow lanes of Old Delhi. 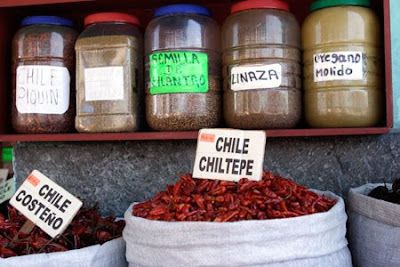 Like India, Mexico is also a land where chiles are a common spice in cuisine. Included in these sacks is golden turmeric, photographed in Marrakesh’s souk. The colours of spices in markets round the world are always favourite sights in any city I visit. Lovely photos! And maybe that's why we love Mexican food. Nice pictures Wendy. I didn't know they have turmeric in Morocco too! I also love visiting the markets of cities. 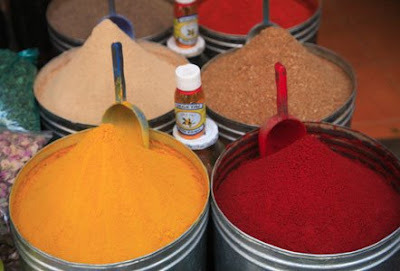 Priyank, I love the color of the spices in Morocco. the colors are beautiful but probably too spicy for me!!! Love the color and richness of these photos! I love eating them too - I think I've become a bit of a spice addict after Asia. Matt and Hobo --looks like you prefer looking at red chiles rather than eating them. Audrey and Catherine, thanks for your kind words. Wonderful photos of all the spices! I love tumeric and would have bought lots of it form thsat barrel! I love these photos! And I love spices to eat and to look at. This post reminds me of the walls of my house, which are all spice themed. My living room is chile, hallway is nutmeg, dining room is tumeric. Pat, I'm with you on the tumeric. Oh Wendy, what lovely colours!